Nebraska’s Upper Loup Natural Resources District is currently (2011) participating in the Elkhorn-Loup Model to understand the effect of various groundwater-management scenarios on surface-water resources. During Phase 1 of the Elkhorn-Loup Model, a lack of subsurface geological information in the Upper Loup Natural Resources District, hereafter referred to as the upper Loup study area, was identified as a gap in current knowledge that needed to be addressed. 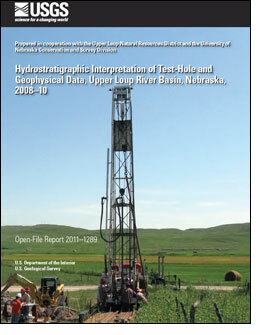 To improve the understanding of the hydrogeology of the upper Loup study area, the U.S. Geological Survey, in cooperation with the Upper Loup Natural Resources District and the University of Nebraska Conservation and Survey Division, collected and described the lithology of drill cuttings from nine test holes, and concurrently collected borehole geophysical data to identify the base of the High Plains aquifer. Surface geophysical data also were collected using time-domain electromagnetic (TDEM) and audio-magnetotelluric (AMT) methods at test-hole locations and between test holes, as a quick, non-invasive means of identifying the base of the High Plains aquifer. Test-hole drilling has indicated greater variation in the base-of-aquifer elevation in the western part of the upper Loup study area than in the eastern part reflecting a number of deep paleovalleys incised into the Brule Formation of the White River Group. TDEM measurements within the upper Loup study area were shown to be effective as virtual boreholes in mapping out the base of the aquifer. TDEM estimates of the base of aquifer were in good accordance with existing test-hole data and were able to improve the interpreted elevation and topology of the base of the aquifer. In 2010, AMT data were collected along a profile, approximately 12 miles (19 kilometers) in length, along Whitman Road, in Grant and Cherry Counties. The AMT results along Whitman Road indicated substantial variability in the elevation of the base of the High Plains aquifer and in the distribution of highly permeable zones within the aquifer. Hobza, C.M., Asch, T.H., and Bedrosian, P. A., 2011, Hydrostratigraphic interpretation of test-hole and geophysical data, Upper Loup River Basin, Nebraska, 2008–10: U.S. Geological Survey Open-File Report 2011-1289, 60 p.